The name and the cute presentation together with the very reasonable price made it a lovely addition to my gift bag items. I'm giving these as favors at a bridal shower. They are fun and unique, and need nothing done with them beforehand, they already come in a cute decorated box with a ribbon. I'm very pleased. The fragrant of the soap was very strong but smelled great so I didn't mind. I packaged them in individual burlap bags as a favor for a garden wedding. Fit the theme beautifully. The soaps were a bit small for the price however the quality and the box they came in made up for it. I still get comments from my guest on how pleased they are with it. The overall setting is really cute and fits my wedding theme. My fiance and I love it very much. My friends all like it. The only short coming is the scent. It does not smell like pear, actually not even close. To me the smell is a little bit too strong, though. However, I would very much like to recommend this product ! Added this to party bag of favors at a Jack and Jill wedding shower and cookout. Not too "froo froo"for the guys and loved the packaging! They pear soaps are adoreable packaging and they have brown little paper it's the cutest thing ever. It fits theme of the bridal shower perfectly. The little boxes made it. The delivery was quick and had nothing wrong with it. I would order here again and again. Great service!!! Perfect favor for the occassion!! This was a nice favor for our guests at the Engagement Party. The presentation and colors along with sentiment, "Perfect Pair" was perfect for the future Mr. and Mrs. I loved the smell of the soap too. Our guests were very impressed. Thank you. I was originally going to use a glittered pear as the place card holder for my son's rehearsal dinner. I discovered your company and came across the pear soaps and was a bit concerned that the gift would not be appropriate, as the rehearsal dinner is formal, but the theme fit perfectly. When I received my order, I was thrilled at the elegant packaging, and the soap smells lovely. 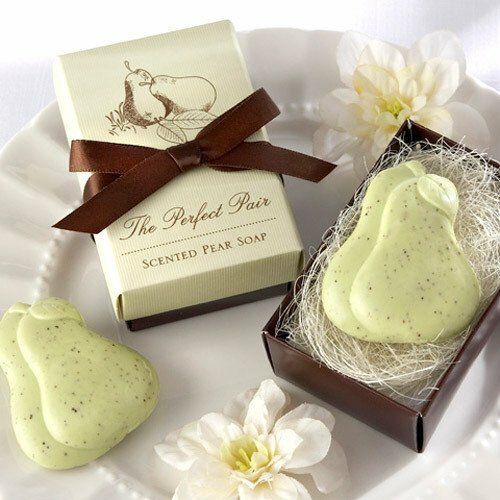 Though I changed my mind in using the pear place card holder, I am still excited to gift the pear soaps. The only disappointment...they are a bit small. I read the reviews and read similar comments. I LOVE this company! I have already shared my great experience with many of my friends. I received my order promptly and was very impressed with the careful packaging. Without a doubt I shall use this company again! We placed the soaps in a soap dish with white netting gathered win a gold ribbon. Lovely and elegant on the table! They were perfect (no pun intended). They were the colors of the wedding. Arrived within 2 days of order. Each individual box was wrapped in cellophane so they stayed neat and clean until the shower. At the shower, each guest received one at their place settings. Using it for favors at a Bridal Shower, it's perfect! Love the natural colors and it's useful. These will be perfect wedding favors! I love it! The packaging is very pretty! The soap smells very sweet. Favors at daughters bridal shower......guests loved them! The perfect bridal shower favor! This is an adorable and meaningful favor that is the perfect choice for bridal showers and weddings. I purchased these soaps as favors for my niece's bridal shower, and the color scheme was a perfect match for her wedding theme. The soaps were beautifully packaged and the scent of the soap inside was magical!I just know that these are going to be a hit with all of the guests! The soap is really adorable; wished it were a bit larger but is beautifully packaged and was a great product to add to the wedding favor bag. beautifully packaged in an elegant gift!!! Beautiful Favors and easy transaction! We gave these out as favors at my cousins bridal shower, they were a HUGE HIT! I ordered these for my son's engagement Party and everyone liked it. They looked smaller than expected but it was a big success. Beautiful & fragrant product !! Displayed the beautiful little boxes in a heart-shaped basket..they not only looked good but had a nice fragrance.. These were favors at the bridal shower, and they were a hit. Everyone wanted extras!!! As a bridal shower favor, I feel that my money was well spent. This item was reasonably priced. Every guest will find a use for it and it is appropriate for all ages. Although the soap was smaller than I thought it would be the packaging was so pretty that I wasn't bothered too much. Have to remember that this is just 'a token':) It looked great on the plates at the table and I was thankful I didn't have to wrap or do anything else except put them out! They smell so good, great presentation! We staged the soaps in a beautiful basket next a picture stand that held a framed personal message to thank our guests for sharing this special event with us. I had 2 giveaways gifts for our guests and I ordered them both from Beaucoup! Great results, everyone loved them. I will order from Beaucoup again for special events. I love the way the soaps were packaged. I just took them out of the mailing box and put them in a basket to be passed out. They looked like little gifts for the guests with the ribbons and bedding inside the box. I purchased these for my bridal shower, and they were a huge hit! The soaps are already boxed and the ribbon is already tied, making them an easy gift to put at each place, without having to do any prep work before hand. It saved me time, and for the price, I imagine it saved me money, too! Everyone loved them. Thanks for a great product! I wasn't sure how I would like the product or if I needed to get additional favors because the one I purchased may not be enough. I was totally satisfied and now I have my favors and they look great! Thank you. It was so perfect for a bridal shower. Big Big hit! The "Perfect Pair" is unique and fits the occasion of a wedding shower. Lovely boxed with bow. Soap smells delightful. We were delighted to find that the favors were as pretty as pictured. I'm sure our guests will be as impressed as we were. I would highly recommend these favors. I gave these as a bridal shower gift and the ladies LOVED them! The box and the ribbon just made it all come together too! Beau Coup made giving out these favors easy! This Perfect Pair Pear Soap was immeasurably more than we expected. It was such a pleasure to give this stunning gift at our daughter's Bridal Shower. We also included them in our "out of town guest bags" since some of our friends and family came to the wedding from out of state and were unable to attend the Shower. Very well received by all! I used this for a bridal shower - garden party style -- It was well received and quite lovely. [...] -- very pleased with it! I was looking for something unique to have as my wedding shower favors and this caught my eye! Very cute, inexpensive and makes you stand out vs. the typical lotion / shower gel combo. It will leave your guests talking for a long time to come! the best party favor idea! i got these for my engagement party and they were perfect! they are not very small and do not need any extra work! they come packed in a cute box with a ribbon. I used these for wedding favors, and was pleased with them. The best part is that I can actually USE all the leftovers! 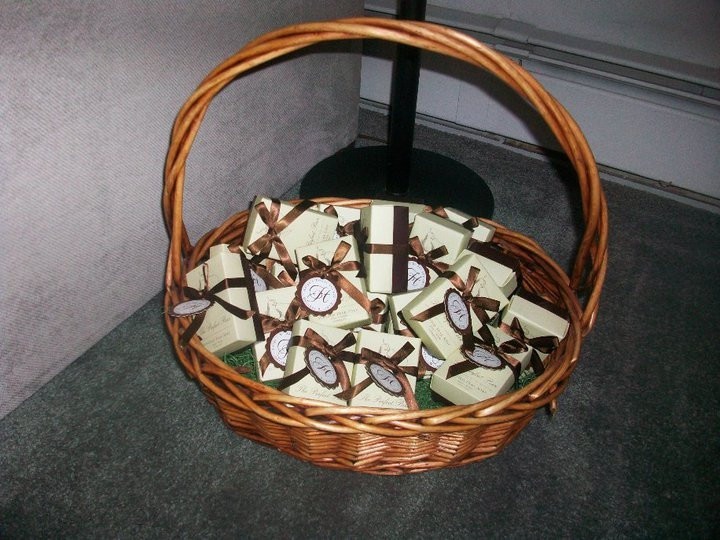 We used the gift boxes pear soaps for bridal shower favors. And the extras will go in Christmas stockings for my daughters-in-law. I bought these for favors for my step-daughters bridal shower. Everyone was impressed by the presentation & the Perfect Pair describes our bride & groom to a tee. The colors actually matched her color scheme. I bought one to try it out. The box is pretty, but the soap is small, about 1/4 the size a bar of soap. The scent is okay, the soap has exfoliating beads, but the color green of the soap is really pretty. Q:If I wanted to order 50 of these favors - how much would that cost.......was confused with how to order this amount. A:You can type the desired amount into the text box. If you type 50 it will show you that the subtotal is $93. Q:What are all ingredients in the pear soap? Q:Is there any way to personalize these favors? A:This is a non-personalized item. We offer personalized tags and labels sold separately on our site. Q:Would this be appropriate to give at the rehearsal dinner? A:The perfect pair soaps would be great for a rehearsal dinner. There are many perfect pairings in life: wine and cheese, sunshine and laughter, you and your soul mate... Why not celebrate new beginnings with these fresh "the perfect pair" pear soap favors? They're perfect as wedding favors, engagement party favors and wedding shower favors. Within each elegant gift box, a pair of pear-shaped soaps lies nestled in a bed of raffia. Pale green with a smattering of brown flecks, each soap looks and smells like a fresh, crisp pear. Soap favors measure 2.25"L x 1.75"W x 0.5"H. Pear-colored gift boxes feature a sketch of two pears and the phrase "The Perfect Pair" written in elegant brown script above the words "scented pear soap." Each box is tied with a chocolate brown bow and measures 3.25"L x 2"W x 1.25"H.